King Baryn has decided that if he marries his daughter Amalie to a high-ranking noble, the rebellious marlords might be pacified and he might be able to avert a war. So he invites all the young serramar to the royal city to court his daughter. To protect Amalie from any unsavory suitors, the mystic Cammon is installed to monitor all of Amalie's courtships, because Cammon is a reader who can tell if someone harbors violence or malevolence in his heart. Much to the dismay of her advisors, Amalie begins to fall in love with the wholly unsuitable Cammon. Even worse, war comes to Gillengaria anyway, and Amalie can only be kept safe through the combined efforts of the Riders, the mystics - and the wild raelynx that has mystical powers of its own. ©2007 Sharon Shinn (P)2008 Audible, Inc. I loved this series so much I hated to see it end. It took sometime to get used to the new narrator, Joe Barrett -- and I have to admit, I never did warm to his interpretation of Kira, but I was able to over-look it. The story was so engaging and the battle at the end was great. 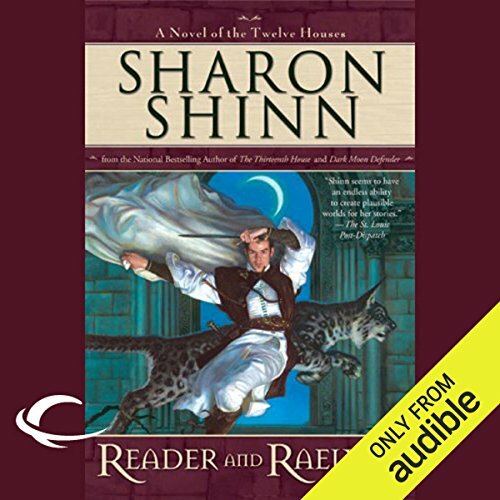 I hope Sharon Shinn continues to write for the main characters, and that Audible gets more of her work soon. Highly recommended.. This is a delightful book. Exciting, imaginative, beautifully written, and wonderfully narrated. The worst part of this book was that it came to an end. I really will miss these characters. I enjoyed all the Mystic and Rider books, but this one was even more exceptional. This book is a satisfying conclusion for the trilogy! It ties up loose ends I didn't even know were there! I love happy answers and happy endings! This has been my favorite series i have listened to to date. I will be re-reading them all again i'm sure. I will miss the characters as i have become so attached to them all. Every book has had me captivated from beginning to end, just wish there were many more book to the series and it never end's lol. Just love it so much. Honestly, when I finish Part I, I'll probably stop listening. If you are thinking of buying this audio book, I recommend you buy a print or ebook version instead. What was one of the most memorable moments of Reader and Raelynx? Won't spoil the plot but it involves the raelynx! The original narrator, Jennifer van Dyck, should have been hired to narrate all five books. She does male voices just fine, whereas Joe Barrett makes Kirra sound like a 1980s drag queen. It is extremely offputting. I could not finish listening to Dark Moon Defender and I don't know if I'll be able to finish Reader and Raelynx. I do wish there was a new version of this book with Jennifer van Dyck. I would buy it, even though I've already purchased this version. Do you think Reader and Raelynx needs a follow-up book? Why or why not? It has a followup book. Unfortunately, it has yet another narrator. Jennifer van Dyck should have been re-hired, especially after the fiasco with Joe Barrett. Stick to Mystic and Rider, Thirteenth House, and Troubled Waters in audio version. Get the rest in print or ebook. And check out other titles narrated by Jennifer van Dyck, especially those by Jack McDevitt. I ADORE this series and this is the second time I’ve read all of them. I thought I would listen to them this time since I have time at work to listen and I loved the narrator of the first two books. This guy, however, is awful. I HATED the way he made Kirra sound and the random accents were super off-putting. Why on earth would Donnel have an Irish accent?? He gives one of the serramar a German accent at one point for some reason??! It’s just goofy. I also detested the hokey cockney accent he used for Cammon. He made him sound idiotic. Don’t get me wrong, you should read this book. It’s fabulous and a fantastic addition to the series. Just don’t listen to it. What made the experience of listening to Reader and Raelynx the most enjoyable? The voices Joe Barrett brings to the story. It's a good conclusion to the series. It was well-written and well-performed. I liked the voices he used for each character. Reader and Ralynx is a great conclusion! Would you consider the audio edition of Reader and Raelynx to be better than the print version? Senneth is my favorite character; she is the center around which the story (in the first four books) revolves. She is a strong character but has vulnerablilties that give her more than one dimension. Next favorite would be Kirra--she can be a hoyden or a great lady with equal sincerity, and she is someone you want to be at your back. Anyone. He had the same voice with only a few differences for each character, and the voice he chose for Tayse sounded like a prude who had just eaten a lime. I love Sharon Shinn's books of the Twelve Houses. I'm so very sorry she has concluded writing about this world. Would you try another book from Sharon Shinn and/or Joe Barrett? I am very afraid of ending up with love story instead of fantasy. I nearly dropped this one. The first three books were very interesting. Good magic mechanics, great world making job, well thought characters and friendship. However the friendship was strangely ideal but I could have lived with it. And then the love went treated the same way not once but many times. This simply was too much for me. But perhaps I am simply not a good recipient for this. Many other reviewers tend to react differently. Love like in fairy tales. The same thing is happening again and again, stealing the story away, putting an end to the dynamic. You do not want to endure more of this even to know how good and bad magic would clash. As said before, the love part is chocking the story. Could you see Reader and Raelynx being made into a movie or a TV series? Who should the stars be? Well yes. I think it is different enough from what has been made till now. Good action, strong characters and independent women. However the love story is probably to conformist and ideal with too few twists. Comparing with Patricia Briggs (Mercy Thompson), the love component also annoys me very much, however it is very different in nature (the same as in Vampire's diary). Comparing with Faith Hunter (Jane Yellowrock), this I like very much. No fairy-tale-like love, it is more grown-up and blends well with the story line. Even though it is again one woman and two men (possibly three), exactly as Mercy Thompson. What Accent Is That Supposed To Be?? Would you listen to Reader and Raelynx again? Why? Yes. I have read the book several times, and I will definitely listen to this again. The only thing that spoils it slightly, is the ridiculous accent Joe Barrett gives to the character of Cammon. The story is superb. Lose the silly accent he assigned to the main character of this book in the series, Cammon. I have loved these books for years. I love the characters, and the action is wonderfully done.